Lotus Notes is designed as a collaborative emailing platform developed by IBM. It can easily be used for email communication with a great efficiency. Even it can also be considered as the Personal Information Management software for managing the mail data such as events, tasks, notes, attachments, and so on. 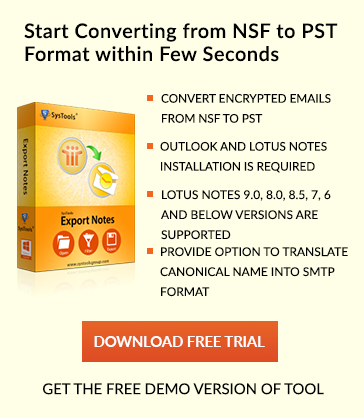 NSF is the proprietary file format used by Lotus Notes. However, due to all the logical as well as physical errors related to such software that remains associated with severe corruption. In the following segment, we will discuss some of the reasons behind database corruption along with the resolution for fixing “RRV bucket is corrupt” error message. Additional Trick: – Download and install Lotus Notes to Outlook PST Converter which help you in securing your data and avoid data loss. Before performing any action on lotus notes database files, secure your data first. Amongst all reasons for corruption, the Notes RRV is one of the most concerning issues. Generally, this problem is not known by multiple end users. RRV signifies as Record Relocation Vector, which indicates to the Lotus Notes Database. Whenever users want to access emails in Lotus Notes then, RRV bucket locates the object identifier in the database. But if the RRV bucket becomes corrupt then, Lotus Notes cannot locate the preferred object identifier. In such case, the Lotus Notes database fails to open any object for creating a new replica and get an error message appears on the screen: “RRV bucket is corrupt”. 1. Sometimes, if RRV bucket is being severely damaged then, Notes become fail to open and displays the error message. This basically occurs due to corrupt bookmarks or icons. This problem may be resolved by taking the backup of all files and after this, renaming the desktop5.dsk (R5) file. After completion, rebuild it again. 2. If Notes end users are still unable to open database file even after renaming and rebuilding, then, try to rename the bookmark.nsf file. If users are log in to the client successfully then, they have to remove a corrupt icon from a workspace. Such problems occur in template-based DB. Recover the data from the recent database backup. Now, using R fixup -f”, and then “compact -c -i” command to restore the corrupt database file. Note: If the inbuilt Lotus repair software does not ensure to repair a corrupt database then, users can use some professional Recovery software to recover the database items. Use a backup copy of the database for restoring the mailfile. After this create the new archive database using a backup copy. Go to File menu and choose the Database and then, click on Properties option. Now, selecting the File option, click on the Applications and Press Properties (For Lotus Notes 8). Then, Click on the “i” tab. This will display the amount of space currently used by Lotus Notes data from the ‘Disk space’. After that, users have to set the desired archive settings for Lotus Notes emails. Next, launch the email application. Open the mail settings by clicking on the Actions>> Archive>>Settings. Under the Criteria tab, select the ‘Default for last modified’ option. Click on OK button and enable the specific Criteria. Now, Start the mail application. Then, select the particular folder that needs to be archived. After that, click on Actions, choose Archive and select the Archive Now option. Next, choose the desired time to start the automatic archive process by selecting the Yes option. Launch the email client application. Select the specific email or folder that has to be archived. Now, drag the required email messages to the archive folder within the Navigation panel. Whenever the user tries to open an email file, they may receive the following error “Lotus Notes Exception – RRV bucket is corrupt”. Moreover, there are any other messages related to RRV bucket, which users may come across. Even when users try to open the file then, they might face such issue “HTTP Web Server: Lotus Notes Exception – RRV bucket is corrupt”. This mail file cannot be opened in both Notes and Web.” For such situation ‘Design refresh or replace’ will help to resolve the error. While performing the database administration tasks such as replication, refresh or replace design etc., most of the users may experience such issues. Step 1: In Lotus Notes, if users compact the database, this application first needs to make a temporary copy of the database, compacting the data and after this, changes back into the original database file. At times, compaction process might be failed if there has not enough space on the hard disk so, the disk space has required saving the database copy while performing the compaction. Then, navigate the File menu and selecting the Database and click on Properties. Next, select the Info tab. After that, check the specified percentage, if it is below 90% that means the unused space is around 10%, thus users can easily compact the database. Click on the Compact to shrink the database. First of all, shut down the router on a server console. Run the load command convert -e maildirectory\mailfilename. This cmd helps to prevent the routing of email to the mail file. The user’s mail file comes in the mail directory. Now, the users have to enable the IMAP for each email files within the \MAIL subdirectory using the load convert -e mail\*.nsf command. Once the mail file is enabled, then, load the router using the load command. Final, Configure the IMAP client software. Note: The email conversion software can run on a single mail file or multiple email files within the directory. As we know corruption is one of the major reason while accessing the Lotus Notes email. Well, in the above section, we have mentioned all possible causes along with manual solutions to fix the Corrupt RRV bucket issue in Lotus Notes. In case, if all workarounds do not work properly then, one can use this Fabulous software named as NSF to Outlook Converter for resolving the issue without any risk.